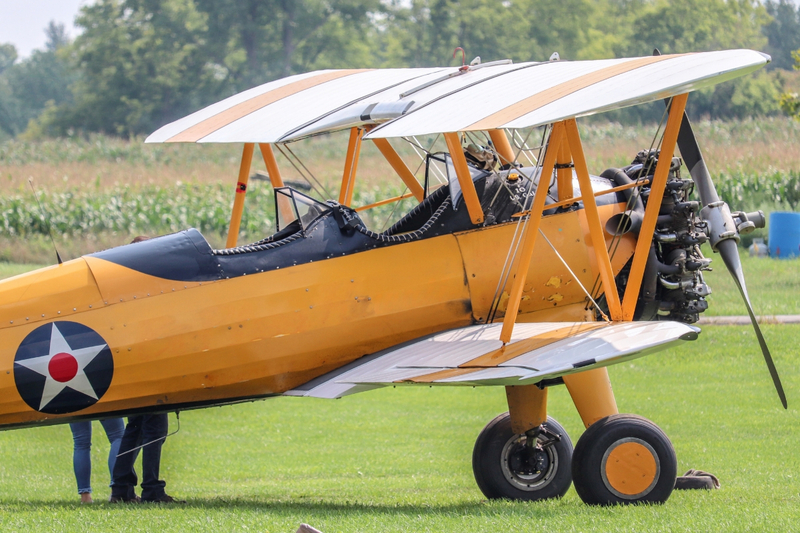 This year, WNY Skydiving is excited to be able to offer our customers a unique aviation experience – biplane rides! A biplane is a fixed-wing aircraft with two main wings – with one stacked over the other. We are flying a 1942 PT-17 Stearman, featuring a powerful radial engine which provides incredible lift from the dual wings. This biplane was primarily a training aircraft in the military during WWII. After the war, it was converted to a crop duster and used as a spray plane until 1992. After that, the spray equipment was removed and the aircraft was returned a dual cockpit plane. Since then passengers have been enjoying the thrill of biplane flight in an open-air cockpit. Last year, licensed skydivers at WNY Skydiving had a blast climbing out onto the wing and making their most memorable skydives! Wondering what to expect from your biplane experience? Read our FAQ and preparation guide. Our open cockpit biplane rides feature spectacular views and can provide a thrill of a lifetime experience. 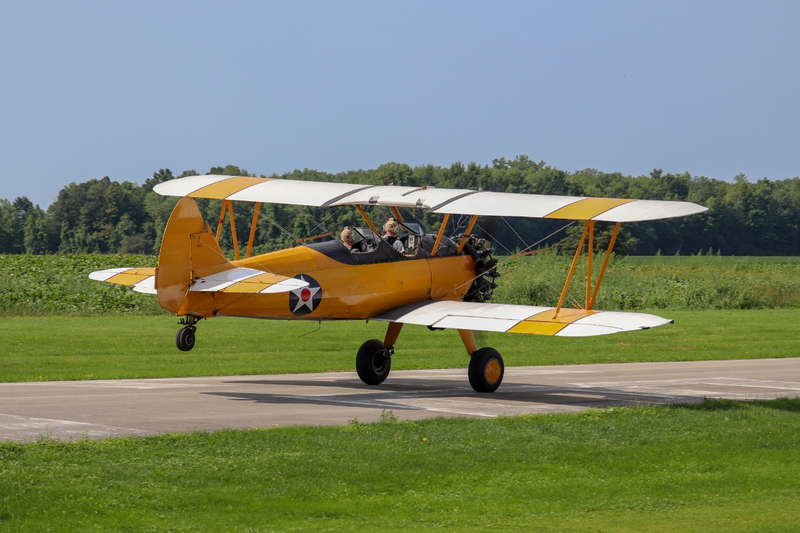 Give a biplane ride as a gift, take a friend up for the ride of their life, or go for a solo aerobatic ride and experience the full power and maneuverability of our Stearman biplane. 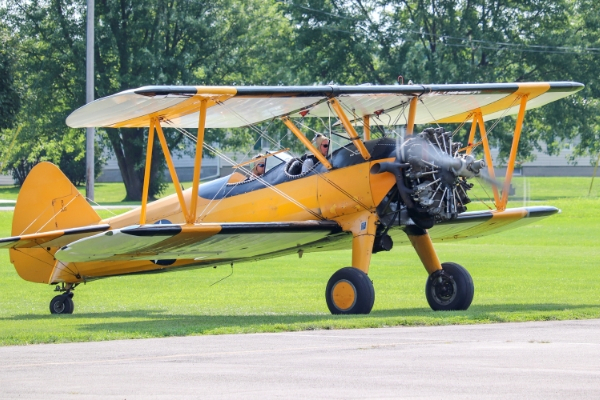 Dual Passenger Flights: Our Stearman Biplane offers side-by-side seating for two so take the opportunity and share the adventure! Together you can experience the joy of soaring through the skies in an open-air cockpit. Due to FAA regulations, all dual passenger flights are non-aerobatic. Single Passenger Non-Aerobatic Flights: Welcome to the wonderful world of aviation! On this flight we will introduce you to the experience of flying in an open cockpit airplane. Sit back, relax, and feel the wind rushing through your hair. Enjoy the view from 1,500ft. This will be a flight like no other! Single Passenger Aerobatic Flights: Thrill seekers, this is the package for you! The best way to TRULY experience a biplane ride is with an aerobatic flight. Your pilot will take you through a series of exciting loops and rolls – an experience that is the closest to true flight you can get while remaining in the plane! For your safety: Before your flight, the pilot will give you a brief security briefing and explain how the controls work. He will then fit you with your seatbelt and headset. Age Limit: All passengers must be at least 18 years old to fly. You will be required to present a valid government-issued photo ID when you check in for your flight. Weight Limit: Weight limits are due to restrictions of the aircraft. The maximum total weight for dual passenger rides is 320 lbs. The maximum occupant weight for aerobatic flights is 215 lbs. All reservations require full payment at the time of booking. Credit card payments can be made over the phone or using our convenient online booking service. We accept Visa and MasterCard payments through our online payment gateway. Discover Card payments can be made over the phone. When calling to make a reservation, please have your payment information ready. Cash/Check payments must be received at least 7 days prior to the scheduled reservation date. To arrange a cash payment, please call 716-597-7393. We do not offer a cash discount. All passengers must be 18 years old on the day of their flight. Government-issued photo ID (divers licence/passport) will be required upon check-in. All flights are NON-REFUNDABLE. However, flights may be transferred with authorization from the original purchaser. We require 24 HOURS NOTICE to reschedule a flight. Failure to appear for your scheduled class time will result in forfeiture of your reservation. In the event we are unable to fly due to inclement weather, you will have up to 1 year from your original reservation date to reschedule. Passengers and spectators are NOT permitted to bring pets to the airport. Service animals are permitted. Consumption of alcohol on the property is STRICTLY FORBIDDEN during hours of operation. This applies to both passengers and spectators. Passengers should NOT consume alcohol within 8 hours prior to arriving for their flight. Children and spectators are welcome at the airport; however, we DO NOT provide a babysitting service. Children must be accompanied by an adult at all times while at the airport. WNY Skydiving is not responsible for any children accompanying our clients. For More Information Call 716-597-7393! Book a Biplane Ride Today!